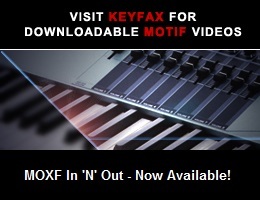 Viewing topic "New to motifator not new the mitif6 but…..,"
Welcome back to your Motif and welcome to Motifator.com! You’re right on several counts: Motif remains a very powerful instrument. However it is an almost 20-year old design now so it’s not realistic to expect to be able to get too much in there way of ‘modern’ add-ons and updates. I’d recommend you first pick up one of the instructional videos made back in 2001 but now available as a download for the Shop here on Motifator.com. Three separate videos were made and this set will get you on the right track for sure. The main problem you may face is hardware: we’re no longer able to source either the memory for the ‘Classic’ (not crucial except that sampling, or loading sample banks require it), or the SmartMedia cards used for storing and loading voices, patterns and arpeggios etc. If you do not have any of these from your original usage of the instrument, we ‘may’ have a small number of ‘used’ SmartMedia cards here. Alternatively, you may find Classic owners here on the forums can help you out. Assuming you can or have access to a SmartMedia card there remain tons of great voice libraries here In the shop. Best of luck re-acquainting yourself with your old friend. I’m sure it will be a pleasant and rewarding experience. You may be able to find some of the PLG cards out in eBay land which could add some interesting synth options to the armoury.